in the first floor drawing room of Malplaquet House, London. 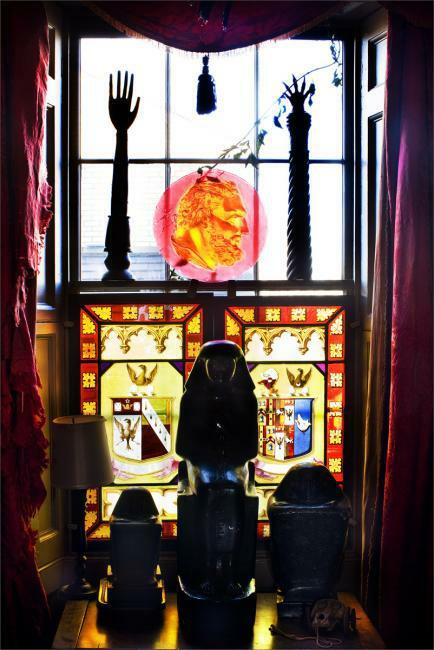 A recent visit by Decorative Arts Trust speaker Todd Longstaffe-Gowan conjured up images of his remarkable London residence, Malplaquet House. 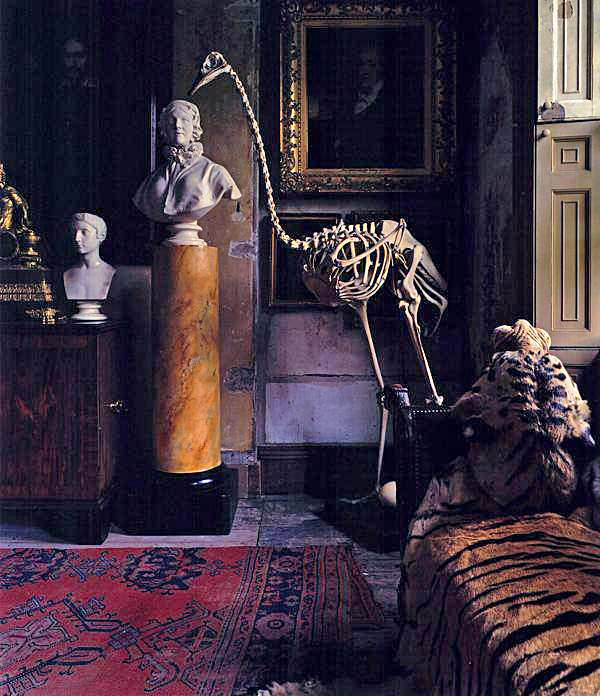 Shared with his partner Time Knox, former head curator of Britain's National Trust, former director of Sir John Soane's Museum (possibly this writer's favorite site in all of London), and now the new director of the exceedingly prestigous Fitzwilliam Museum, the couple bought the house from the Spitalfields Trust in 1998. 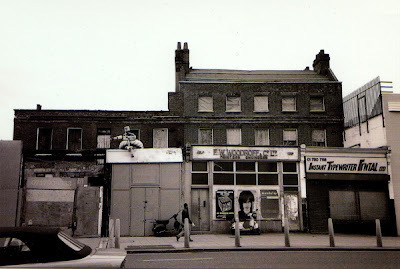 Malplaquet House as it appeared in May, 1998. 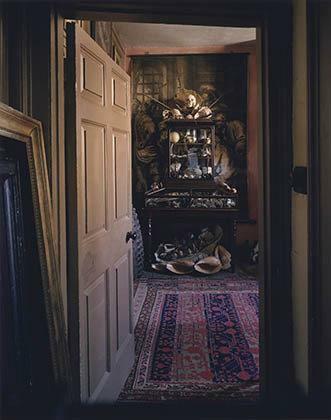 Their friend, architectural historian Dan Cruickshank knew they were in need of larger quarters for their growing collections and suggested that they take a look. The house had not been used as a residence for about 100 years, resulting in a level of preservation by neglect despite commerical additions. Purchased for GBP 250,000 (about $410,000) and renovated over a period of four years at a cost exceeding the purchase price, the Grade II-listed townhouse has become a celebrated landmark of the Stepney Green conservation area. Malplaquet House in May, 2010. Malplaquet House was built on speculation by Thomas Andrews and completed in 1742. The name comes from the 1709 battle of Malplaquet, but it is not sure if the association comes from the occupation of the widow of a merchant who sold war salavage or from a subsequent tenant, Edward Lee, a retired military surgeon. 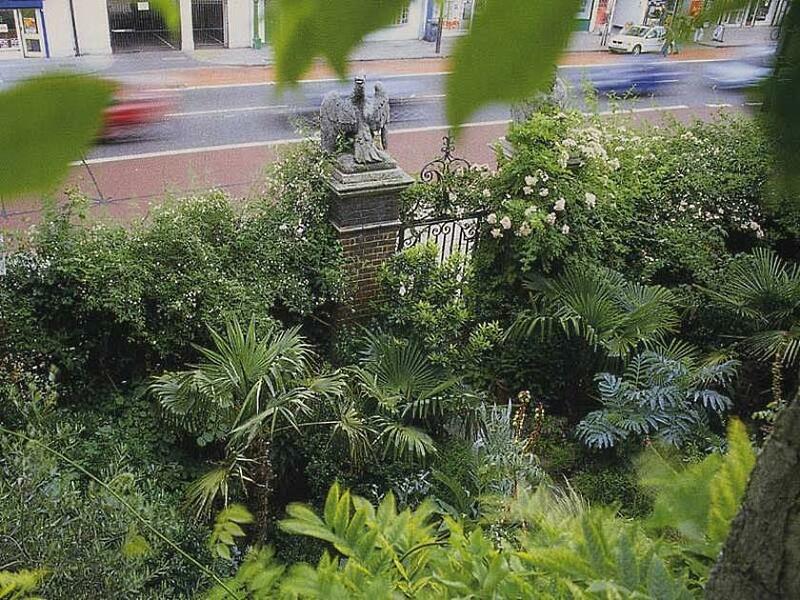 The front garden of Malplaquet House. Todd, who is a royal gardens advisor in addition to having designed landscapes for private clients such as Charles Saatchi and Lord Jacob Rothschild, created a lush forecourt to act as a buffer from the busy street and a small but lushly planted rear garden, reduced to ten feet by the previous owner. 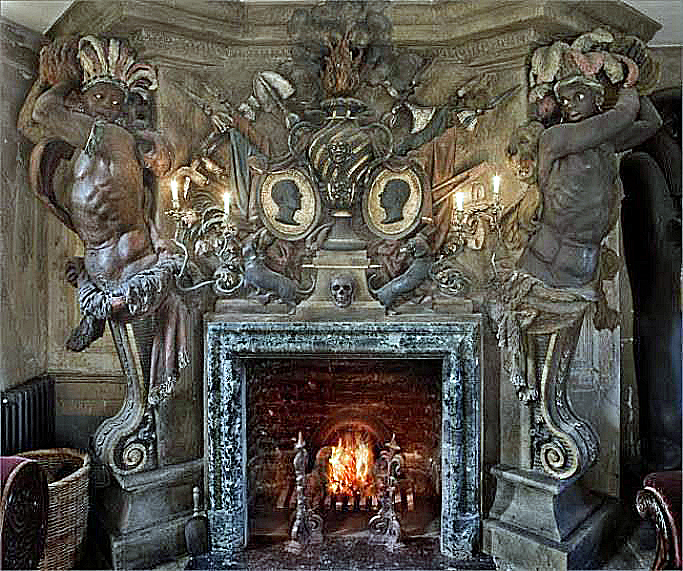 When the opportunity allowed the creation of a new feature, a fantastic allegorical chimneypiece was designed and executed by their friend Christopher Hobbs. (Other examples of Hobbs' work can be seen in previous posts about The Menagerie here and here). 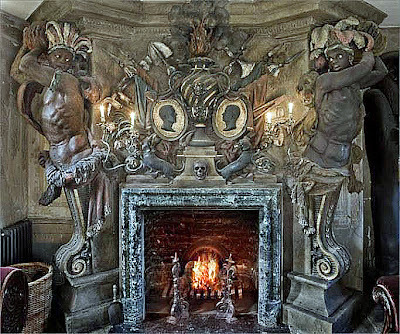 The chimneypiece is flanked by figures symbolic of where the owners grew up: Tim in Africa and Todd in the West Indies and South America. Plaques bearing the owners' profile are featured as are their miniature dachshunds, Tiger and Sponge. Twelve feet tall and entirely made of plaster except for one element, there is a human skull found by Hobbs among the ruins of a demolished YMCA. "We like to think it's the remains of an unpopular aerobics instructress" Todd told Christopher Mason in a 2007 interview for Departures. All spaces are utilized to display the collections. Modern conveniences were inserted with the least intervention possible. Otherwise the existing 18th century interior detailing was preserved. The kitchen at Malplaquet House. The scholarly collections are displayed throughout the house. 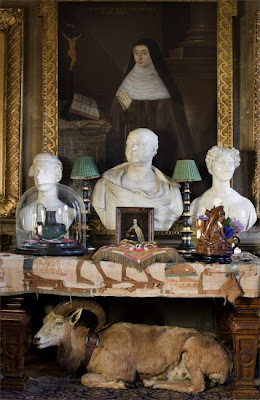 A mountain goat 'rests' in the drawing room. Egyptian artifacts form one collection. 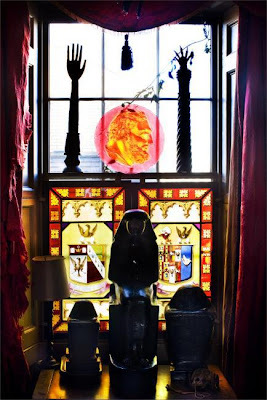 Photo from the Facebook fan page for Malplaquet House. form another collection at Malplaquet House. Photo from the Facebook fan page. There are six bedrooms and two double reception rooms in the house which totals 4,234 square feet. A view into the southeast bedroom. 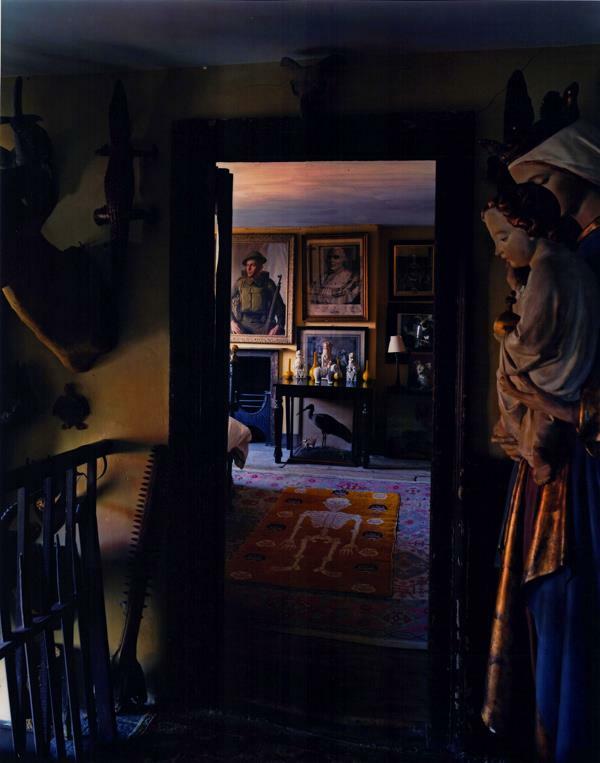 A view into the northwest bedroom. 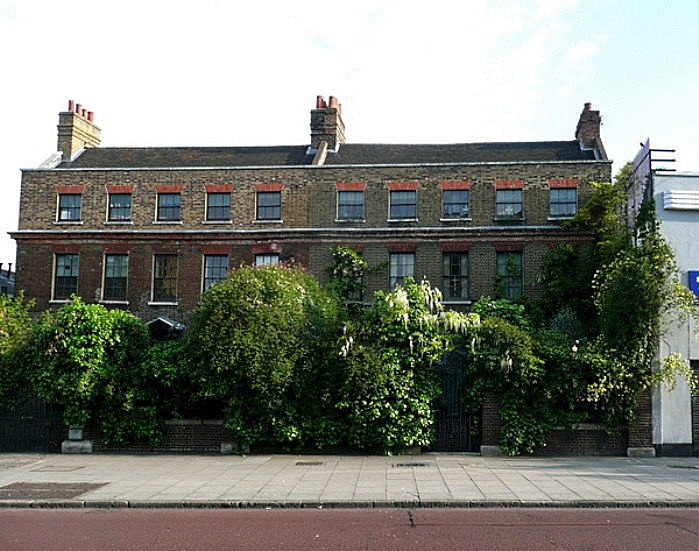 An article in The Telegraph, August, 2010, stated that the owners were wanting a house with a larger garden and that Malplaquet House was listed with Jackson-Stops & Staff for sale for GBP 2.25 million. The position of director of The Fitzwilliam Museum comes with a house in Cambridge, however, a villa with a large garden, only an hour away from Malplaquet House. So, for now at least, Misters Knox and Longstaffe-Gowan have two residences. And the opportunities for the collections to grow continue. 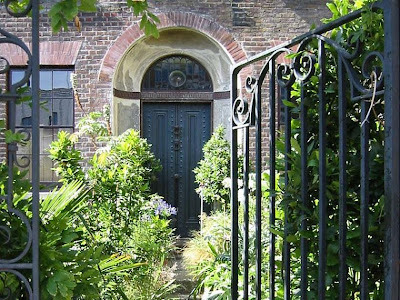 The entrance to Malplaquet House. You barely recognize the facade between the photos -thats what I call a fixer upper! 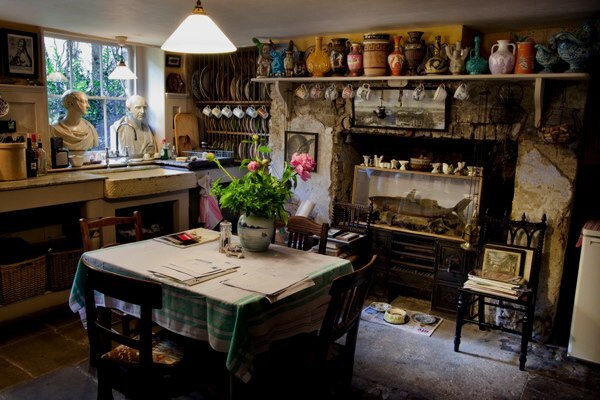 Really an extraordinary house and it's just lovely to see people investing in pieces such as that chimney mantel that can grow with the house and become a part of its history. Thanks for your comment, Stefan. That new chimneypiece truly falls in the category of Fantastic, doesn't it? I always enjoy getting a peek at this house. It is fascinating, although I don't think that many could get away with that kind of design scheme. Parnassus, the house and contents would certainly be worthy of a great book. 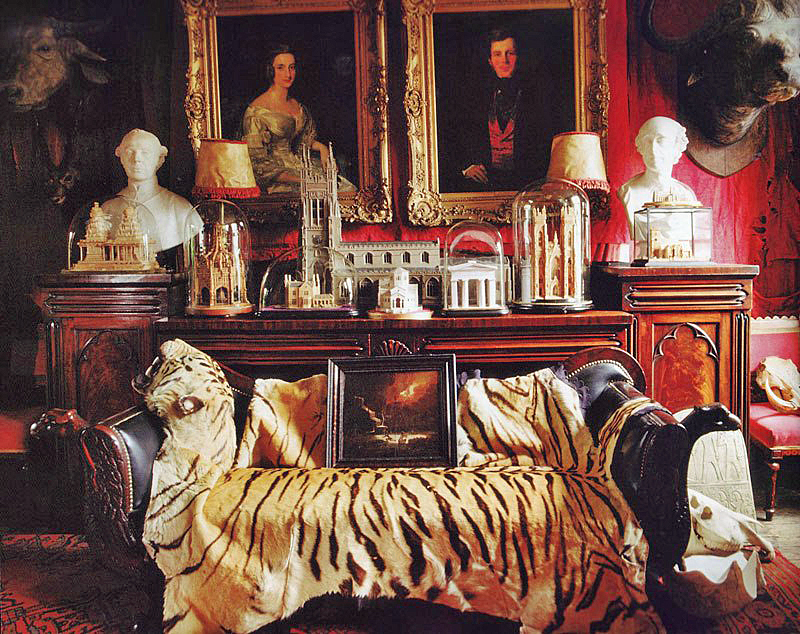 I had thought that I had seen an article in World of Interiors magazine with lots of photos, but I could not find it. 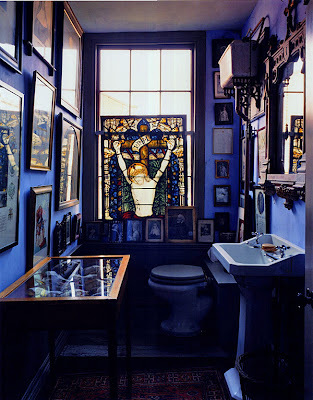 As for the bathroom, the decor is temporary in the big scheme of things. It fact, it may have already changed as none of these photos are new. I salute Todd and Time for seeing the possibilities and executing such an amazing transformation. 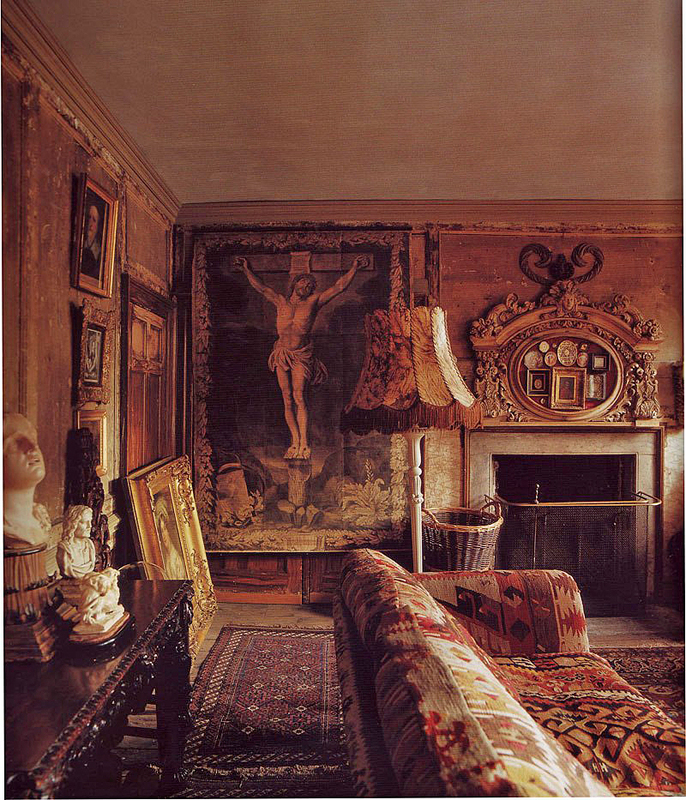 And as a lover of anything designed by Sir John Soane, I can also appreciate the Soane influence on that drawing room! Thanks for a fascinating post! Mark, the pleasure is mine. I enjoy seeing art-filled interiors and this is certainly an exemplary example. Obviously, these two have access to sources of great things--and money, lots of money--that I don't have, and won't ever have, but even those things can be wasted when they're in the hands of the wrong people. The critical third point of the triangle is genius for putting things together and, clearly, these guys have that, too. I think I hate them. Tim came to Chicago for a Royal Oak lecture at The Casino a while back (and getting semi-annual access to that 1920s time-warp was my initial reason for joining Royal Oak) but somehow or other, I missed his lecture, for which I still kick myself. Oh, well. I do have that issue of WoI at home, but I agree: the house needs a whole book. Simply Grand, many - if not all - of their treasures were 'finds', relatively inexpensive despite the quality. And they lived through often distressing conditions for four years while the renovation was completed. But you are right about the genius part. I have never attended a talk by Knox, but I am sure The Casino would have been the ideal venue. The Royal Oak Foundation has some really wonderful speakers; I wish there was more support around the country to sponsor events so more could benefit. Thanks for your comments. Great post John! Good to hear they still have Malplaquet, for now. Tim & Todd's earlier apartment and Tim's apartment before they met, were both photographed by the World of Interiors. They were very humble compared to Malplaquet. I believe that most of their collection, at that time, was acquired from Portobello Road and other antique markets around London at a good price due to their keen eye and unique taste. Thanks, T.A. Yes, they certainly have an eye for finding treasures. OK, John, I finally--two months later--found the WoI article that featured Malplaquet house but which neither of us could find. Not, of course, that I've spent all the intervening time searching for it, but when I stumbled across it this morning--while looking for something else that I have yet to find--I knew I needed to get back here ASAP and tie up at least this one loose end. One does what one can. It's the issue for October 2003. Thanks, Bart! I'll keep an eye out for that issue. One might think I'd have all the issues in order, but no. who prior to the London property had a town house similarly filled in Edinburgh's New Town, which I visited. Columnist, there is a LOT more taxidermy that I did not show. Although not my personal taste for residential decoration, I appreciate the uniqueness of it all. I really like this house too. I think it represents wonder English eccentricity but I suspect not many would like to live like this. V., the epitome of eccentricity for a residence today but not unlike some historic houses. Thanks for commenting. As an Attingham student in 1991, I visited the National Trust property Calke Abbey and many similarities come to mind. I love the whole house!What a collection they have acquired!They have done a marvelous job!Hats off to you two!BRAVO!The jungle entrance is stunning! La C., that entrance garden is an incredible 'after', especially considering the 'before' isn't it? Thanks for your comments. have Mr Longstaffe-Gowan's own photograph of what the house looked like "before"
Thank you, Toby. Todd said that the store facades were left in place after the extension was removed and the garden planted. But they woke up one morning after an intense storm to discover the storefronts had been blown down. So the wall/fence was created to give the necessary boundary at the sidewalk. 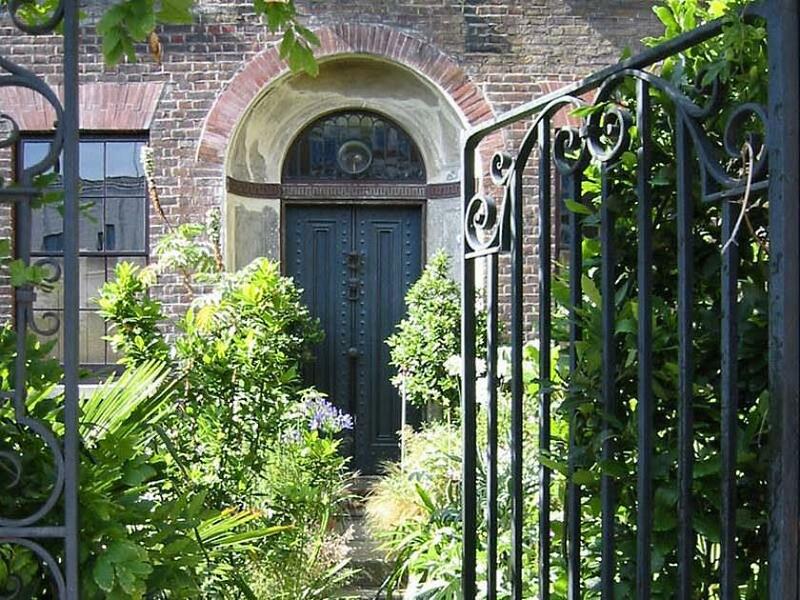 What do you think of Dennis Sievers's house in nearby Spitalfields? Speechless here as usually, emotional about the bathroom. Bravo.